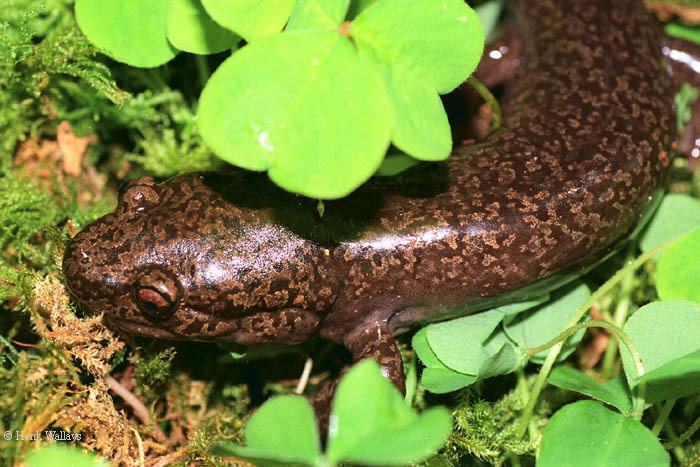 The salamanders of the genus Rhyacotriton have had quite a bumpy taxonomical journey. 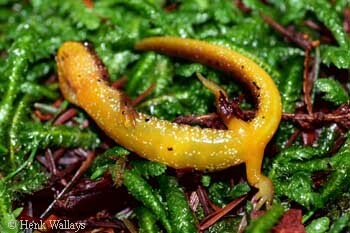 At their initial discovery, they were first included in the genus Hynobius (Gaige, 1917). 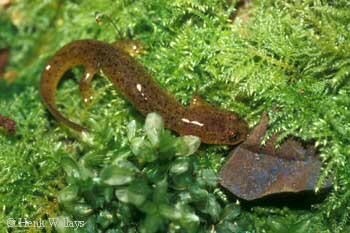 Later, Dunn (1920) placed them into the ‘advanced’ salamanders, and they were thought to be a member of the Ambystomatidae (as was the case with Dicamptodon). In 1958, Tihen (1958) placed them into a separate subfamily, Rhyacotritoninae, and Regal (1966) placed them in a separate subfamily of Dicamptodontinae. They were later recognized as a true family by Edwards (1967). At that time only one species was known, Rhyacotriton olympicus. In 1992 Good and Wake reviewed this genus and discovered that it consisted of 4 distinct species. 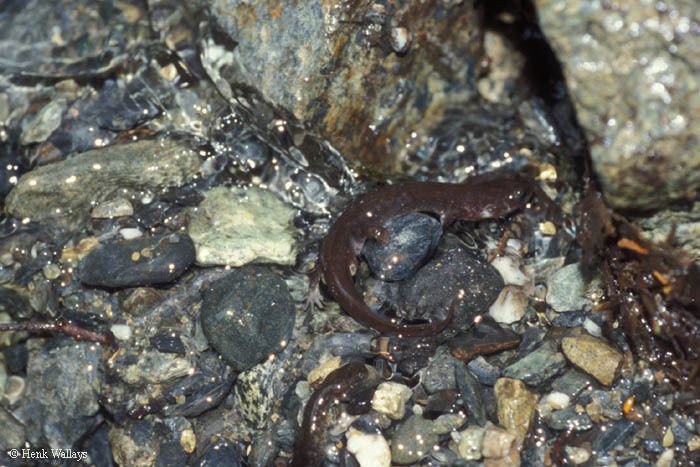 According to Good & Wake (1992), the original distribution of the genus started in the Northern Cascades in Central Oregon and later dispersed into the Coastal ranges, some 15 to 22 million years ago. This continuous range was disrupted in 3 main segments due to volcanic activity during the Miocene age. Later, the most Northern segment got further divided into 2 isolated areas by a massive river, created by the glacial expansion into the Puget Sound region. 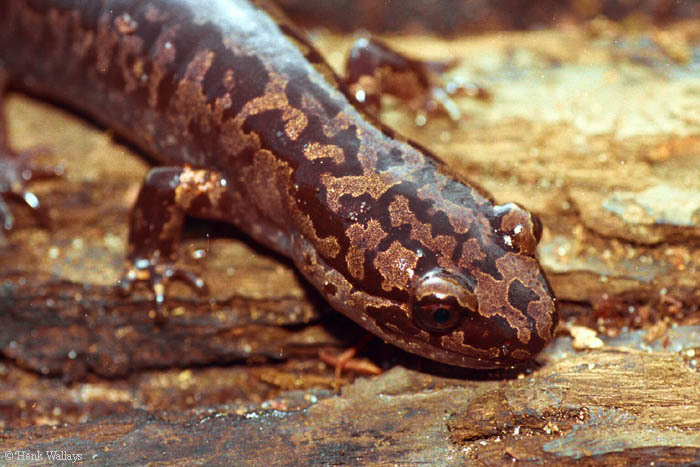 This resulted in 4 genetically isolated areas, each having a Rhyacotriton species. 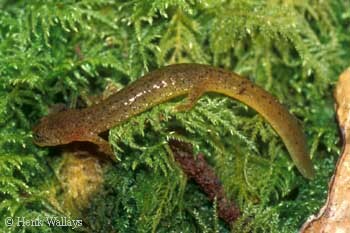 Rhyacotriton variegatus.This species is the torrent salamander with the most Southern distribution and the longest area of distribution. 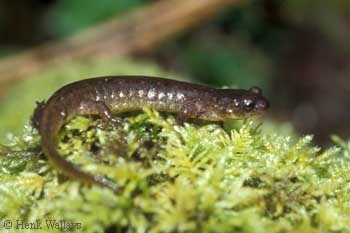 It is found from mid-California up along Oregon to Lincoln City where its range finally meets with that of Rhyacotriton kezeri. Recently, there are some opinions expressed that this species needs revision and might turn out to be more than one species. R. variegatus, Cape Ferello, Oregon. Click photo to enlarge. 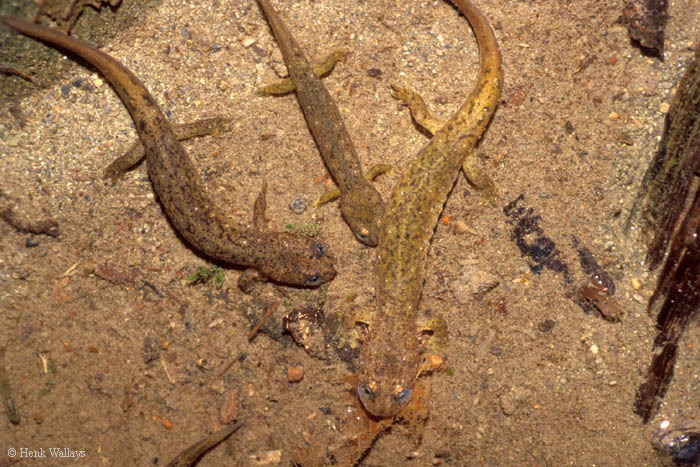 Rhyacotriton kezeri. The distribution of R. kezeri extends from around the Lincoln City area into Washington. R. kezeri. Click photo to enlarge. Rhyacotriton cascadae. 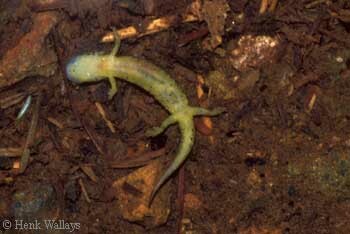 This species lives around the Oregon Columbia River Gorge into the Cascade Mountains. Due to its dispersed distribution, this is by far the most variable and least studied species, and it may turn out to be a conglomerate of several species. 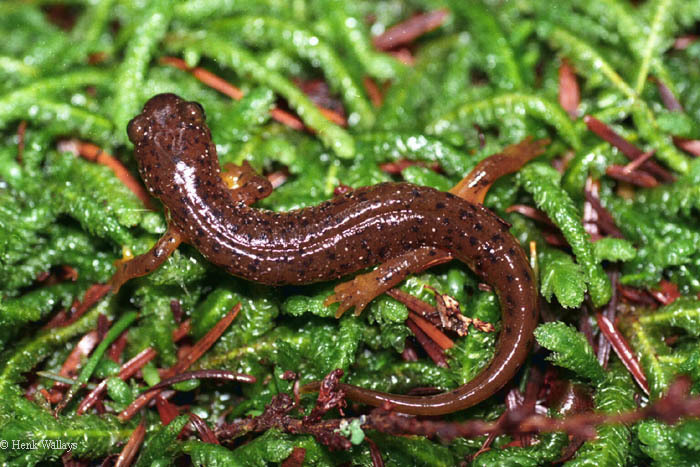 Rhyacotriton olympicus.The distribution of this species is restricted to the Olympic Peninsula of Washington. Its distribution area has no contact zone with other Rhyacotriton species. 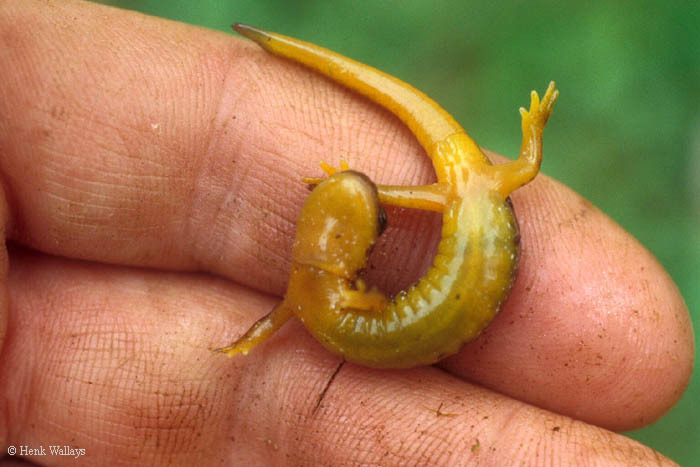 This is the sole species that I have not (yet) been able to see in nature. The demarcation line between the dorsal and ventral coloration is wavy. The back and sides do not carry spots. The belly usually has large dark spots or mottling. 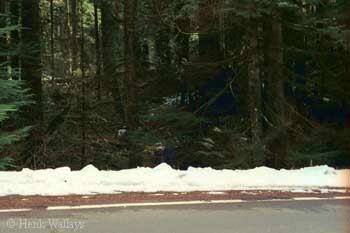 In 1998 and 2001, I traveled to Oregon and California with Russell Kurtz. 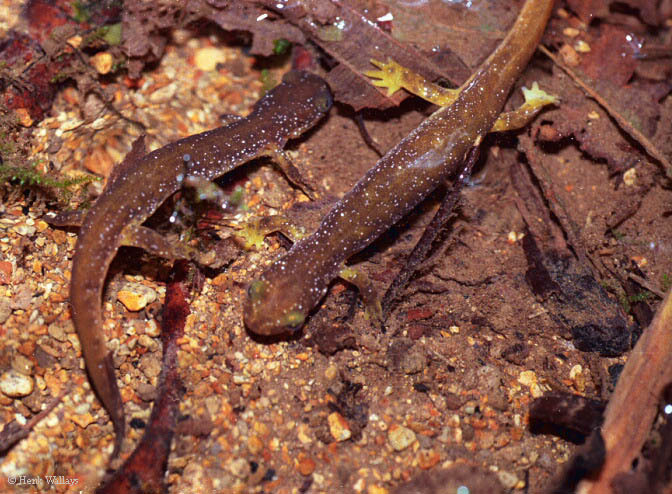 During these trips, 3 Rhyacotriton species were observed in their natural habitat. We also visited the contact zone between R. variegatus and R. kezeri at Lincoln City, Oregon (not mentioned in this article). These field trips were performed during springtime, at cooler temperatures, while some habitats were still snow-covered. With the aid of Brad Norman, we were able to enter a study area of the University of California in Humboldt County, where ecological studies have been performed on both Plethodon elongates and Ascaphus truei. 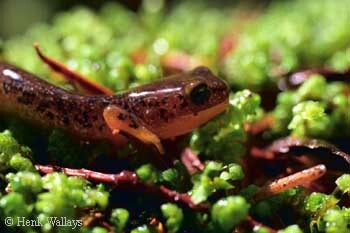 The general idea was to find tailed frogs in order to photograph these on slides (I had failed to find adults before). The whole scenery lay beside a large river. 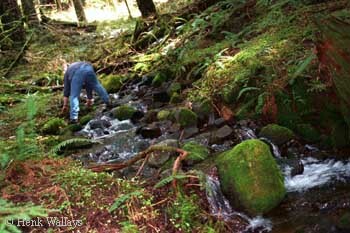 We focused our search around a small stream coming down from the slopes in the woods, finally emptying into that river. The first 15 meters of this stream resulted into some larval Dicamptodon tenebrosus that were hiding among stones and fallen leaves. They measured up to 9 cm in length and are known to be serious predators. We went up a little more following the stream along the emerald green moss carpets. After 20 more meters of stone-turning, we stumbled upon our first Rhyacotriton variegatus. The air temperature was 9°C, the water was a bit colder, 8-8.5°C. Unlike the Dicamptodon larvae, the animals were found in the calmer side-pockets of the stream hiding between some of the fallen leaves or underneath a stone with overhanging moss. All of them were uniformly dark colored, with a belly that carried much green & yellow and with some black spots scattered around. The cloaca of the adult male was very swollen, proving that we were there at breeding season. Finally, after a chase of about 10 minutes, I was able to capture an Ascaphus truei tadpole, but this was again as close as I got to these frogs. Apparently they avoid European tourists. Larval Dicamptodon. Click photo to enlarge. R. variegatus, Humbolt Co., California. Click photo to enlarge. R. variegatus habitat, Humbolt Co., California. Click photo to enlarge. 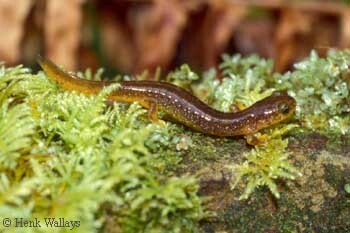 As we went up to Northern Oregon, we intended to look for more Rhyacotriton populations. With this idea in mind, we stopped both at Cape Ferrello, Oregon and Humbug Mountain. 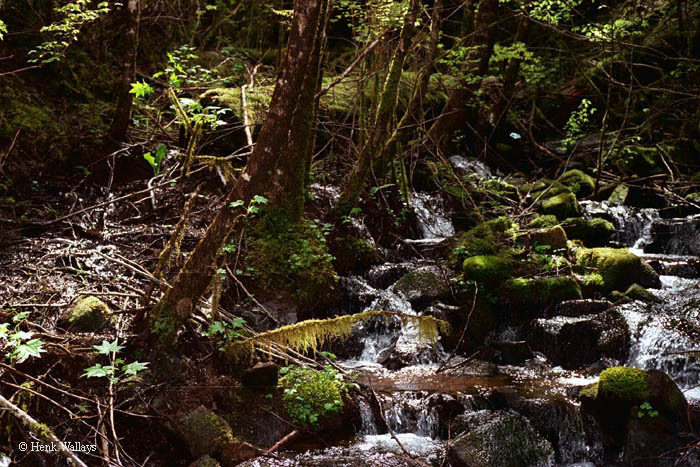 On a northern exposed slope, under the canopy of a primary coniferous wood, we found a small stream searching its way down. The sides were filled with large moss-covered stones and fallen logs of redwood trees. 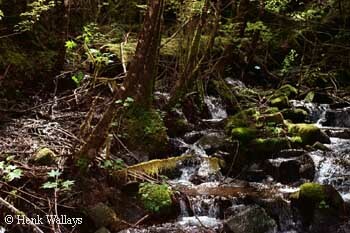 We knew that we were again in Rhyacotriton land and started searching again along the sides of the stream. Hiding in these side pockets, we found some adult Rhyacotriton variegatus. Again, the larger larval Dicamptodon tenebrosus (>10 cm) were lying under stones hidden in the stream. They would certainly not refuse a healthy Rhyacotriton menu. 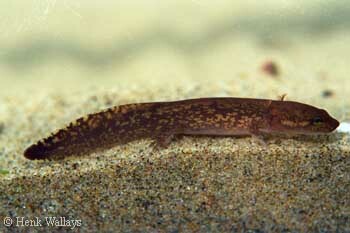 The coloration of the adult Rhyacotriton differed considerably from the Californian animals: they had a less dark color. R. variegatus. Click photo to enlarge. R. variegatus. Click photo to enlarge. R. variegatus, Cape Ferello, Oregon. Click photo to enlarge. R. variegatus, Humbug Mt., Oregon. Click photo to enlarge. Beside this small stream, we noticed a wet heap of small pebbles. A small seepage came through and underneath these pebbles, flowing downwards to feed the stream in which we found the adults. On top of the pebbles lay fallen fern leaves and pieces of wood. While removing some of this debris, the richness of the invertebrates living on these particles was surprising. Quite a large number of crustacean-like invertebrates (resembling Gammarus) jumped away upon removal of the debris. The pebbles were quite small (2-4 cm), and the holes were miniscule. Replacing and moving some of the pebbles frequently revealed larval Rhyacotriton variegatus wriggling their way out of the disturbed area and trying to dig underneath the pebbles further away. The black dots on their backs made them difficult to spot among the stones once they stopped moving. We could only find them while they were moving or by the reflection of their shiny wet backs. The larvae were practically the same size as the pebbles. From a logical point of view, it looks as if these larvae fled the stream in order to be protected from possible predators. They are able to hide well within the small holes against threatening intrusion and at the same time still benefit from the cold spring water. In about 15 minutes, we were able to capture 7 specimens, with many more larvae and juveniles escaping, wriggling through the pebbles. After taking some shots and measurements, we set them back in their habitat unharmed. 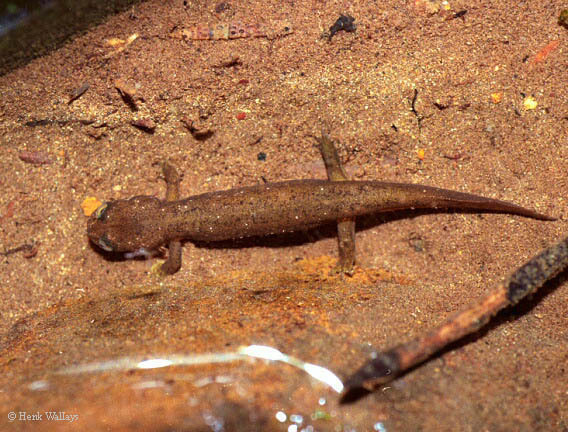 So it looks as if the larger Rhyacotriton more often live along the edges of the stream, whereas the larvae prefer to stay out of the flowing water, for example in a seepage. 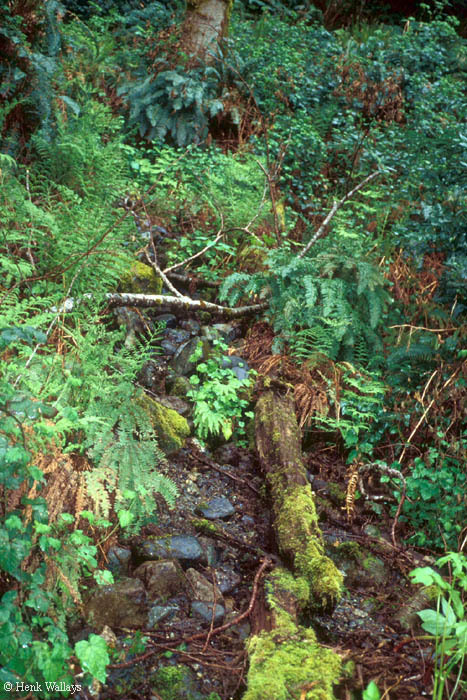 R. variegatus habitat. Click photo to enlarge. 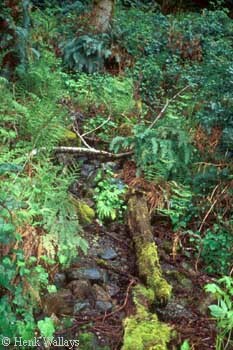 R. variegatus habitat. Click photo to enlarge. R. variegatus habitat. Click photo to enlarge. 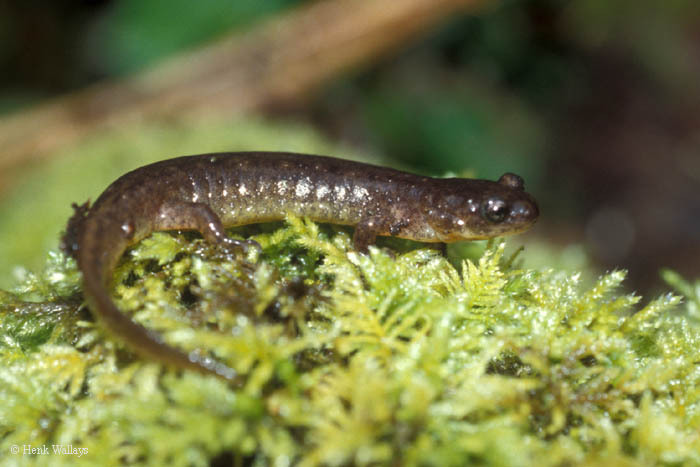 In order to find Rhyacotriton kezeri we went up to the Northern region of Oregon where we encountered difficulties in locating a suitable habitat. After quite some searching we discovered an interesting stream, but since the speed of the water was quite quick we were not too confident. Instead of searching along the edges, we first focused on the little standing side pockets of the stream. These calm water areas were still sparsely filled with fresh and cold water. Slow removal of overhanging stones finally revealed some Rhyacotriton larvae. After capturing about 5 larvae, we finally started to look around the borders of the stream. Two adult specimens were separately caught, a male and a female. Images of the animals and habitat were taken, after which the animals were released. R. kezeri. Click photo to enlarge. R. kezeri. Click photo to enlarge. This species proved to be the most difficult one to find. 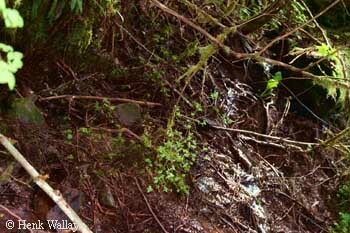 We had been searching at various spots both along the Columbia River Gorge and up on top of the valley in primary woods: none of them revealed specimens. Since most of the spots in the valley were situated in areas of deciduous woods, this didn’t surprise us. But when even the cooler streams on top of the valley in primary coniferous woods did not show these animals, we were loosing confidence. We continued to drive around the neighbourhood up and down the roads in and out of forested areas. Some parts had been intensively logged, and certain places that looked promising lay half-open in the sparse spring sunlight. R. cascadae. Click photo to enlarge. R. cascadae. Click photo to enlarge. Finally we went into Mount Hood National Forest. 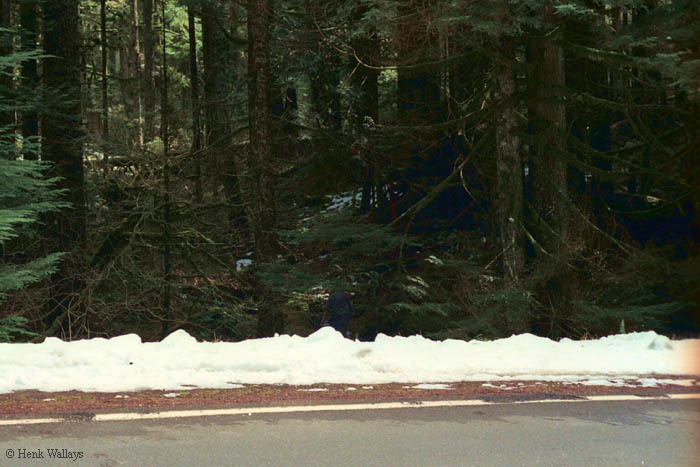 The road kept going up, and soon we came across the ‘snow-frontier’: little white patches were still lying beside the road and in the woods. In the first 100 meters of this cold front, we noticed a stream coming down, going underneath the road. The current of the water was quite fast, so we started looking in the promising side-pockets of standing water and some slowly seeping water areas. At times we were lying down in the snow. Russell firstly discovered a larval Dicamptodon tenebrosus again. Since we had always found both species together, this strengthened our belief that we had discovered a proper spot. I had been checking up on what looked like an interesting side-pocket and noticed some movement when replacing an overhanging stone: a Rhyacotriton larva fled from the light. 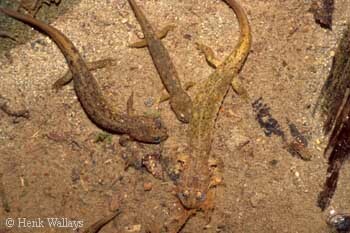 Finally we had found a habitat of Rhyacotriton cascadae. In that same side pocket I turned up 4 larval specimens of various lengths (3 to 5 cm). In the next half hour, we were able to capture about 10 of them. While I was shooting slides of these younger specimens in their habitat, Russell worked his way deeper into the stream, unrolling stones into the side-pockets and started finding adults. These were not found in the calmer water parts, but were more hiding alongside the edges of the streams under moss or stones. Their coloration was strikingly beautiful: the belly was clear orange, with a little bit of white, but no black spots. Most of all, though, their very reddish coloration and the large round black dots made out much of their beauty. Since I had broken my thermometer, we could not measure the water temperatures, but this was surely one of the coldest regions we had visited. R. cascadae habitat. Click photo to enlarge. R. cascadae habitat. Click photo to enlarge. 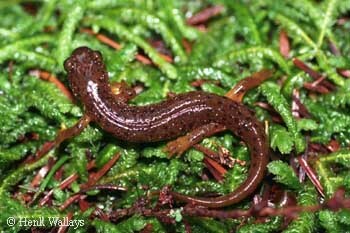 Torrent salamanders require such a specific habitat that they can hardly be called abundant, but when the right spots are present, they sometimes seem to be there in large numbers. 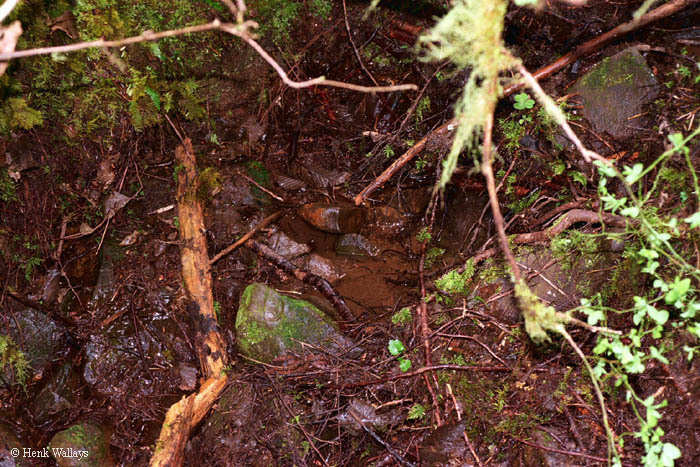 The majority of the Rhyacotriton habitats we visited consisted of small streams or seepages in shadowed areas of primary coniferous woods with a bottom of small pebbles/gravel. 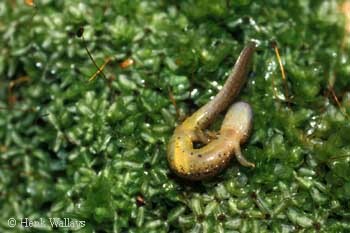 The adult specimens were mostly found along the edges of the streams, whereas the larvae and juveniles prefer seepages with gravel/pebbles or remain in calmer side pockets of the streams that are still sparsely fed with fresh cold water. In all the places the temperatures were very low. We did not find animals in water temperatures higher then 11°C (mostly in the range of 5°-9°C), so they like it cold. For this reason, it is also best not to handle them too long. After a while they kind of remain passive (heating up? ); setting them back in the water slowly revives them. We didn’t find animals in streams with large rocks and stones, where the gaps between the stones surpassed 3 to 5 cms. The size of the stones ranged from less then 1 centimeter to a few centimeters. These tiny holes are at the same time a good protection against larger predators and allow them to dig in deeper when temperatures increase, for example during the warmer summer months. 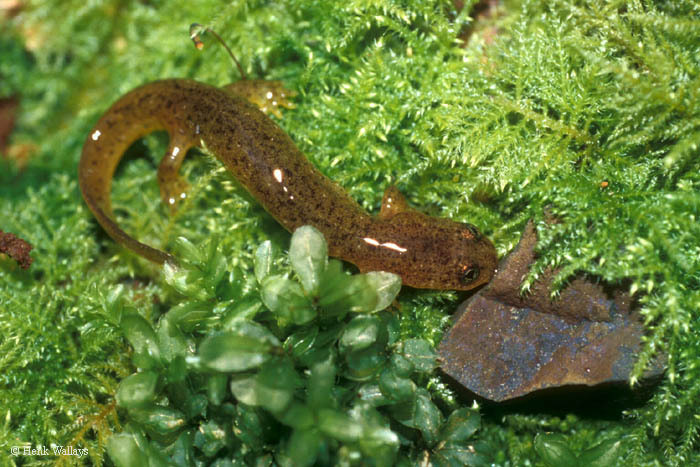 So far, very few nests have been discovered for any torrent salamander species, but they seem to deposit deeper in such stones (Nussbaum, 1969). 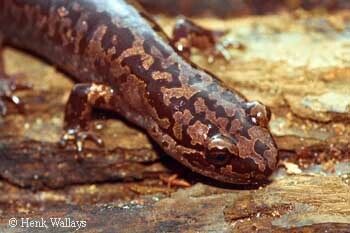 Requiring such a specific habitat, these species are indeed quite fragile and together with Ascaphus truei (the tailed frog) they are considered ‘keystone’ species. They benefit from a protected status. As for natural enemies, they are certainly preyed upon by the larger Dicamptodon tenebrosus larvae living in the same habitat. Their largest threat however consists of something completely different: logging. A primary coniferous wood functions as a large umbrella. The thick canopy prevents sunlight from heating the ground, and the ground moisture also buffers against higher temperatures. In fact, when entering such a wood with a short-sleeved T-shirt, it feels like you are entering a refrigerator; temperatures are lower and the air humidity is very high. For example, during our trips, the air temperatures outside the wood ranged from 12-17°C. Inside the woods we measured temperatures ranging from 7-9°C. 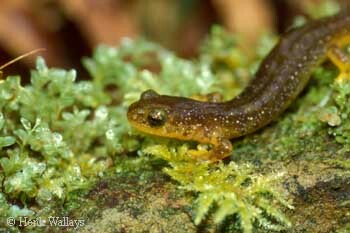 Taking away trees directly around a habitat or even on top of a habitat can drive a Rhyacotriton population to extinction. 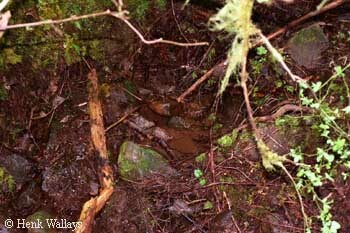 Erosion sets off in the stream, with silt filling the necessary holes between the pebbles/gravel. This means no more hiding places against predators, and exposure to warmer temperatures. The larvae are most fragile, being by definition restricted to the water. If such a ‘logging disaster’ happens, their long larval life becomes an important adverse limiting factor. Since these animals are tied to the water, they can only go up higher or descend the stream. While the latter choice would probably be the easiest one, it is likely to end in a trout-inhabited stream. The adults, on the other hand, would need to find another typical Rhyacotriton habitat again, before they warm up or dry out. They can perhaps get away from the stream, but do require cold and very humid conditions while on the move. Dicamptodon tenebrosus. Click photo to enlarge. Dicamptodon tenebrosus. Click photo to enlarge. Good DA , Wake DB. 1992. Geographic variation and speciation in the Torrent Salamanders of the genus Rhyacotriton (Caudata: Rhyacotritonidae). Zoology 126: 1-91. Nussbaum RA. 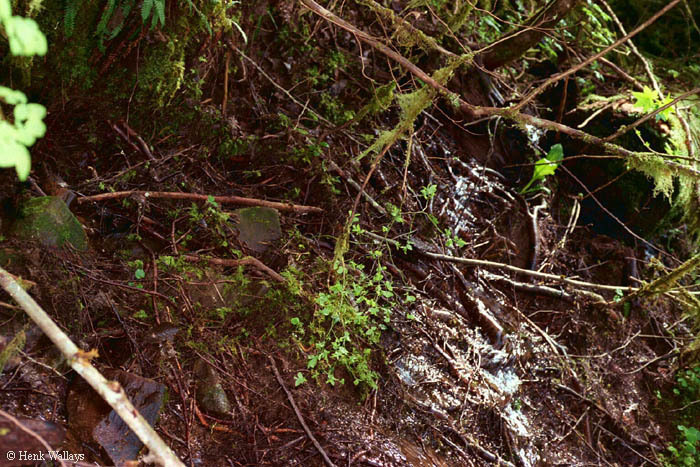 1969.A nest site of the Olympic salamander Rhyacotriton olympicus (Gaige), Herpetologica 25(4): 277-278.